This is El Valle de los Caidos (The Valley of the Fallen), Spain’s most controversial historical monument. 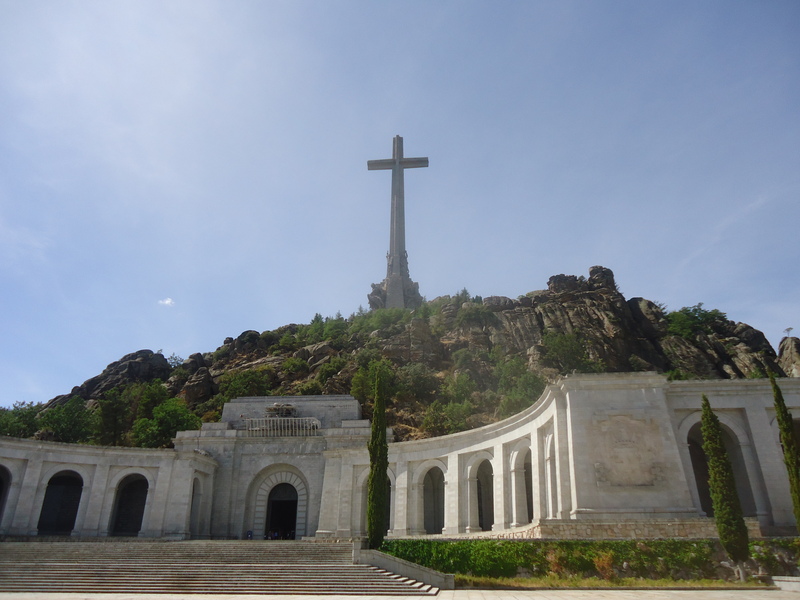 Here, buried deep beneath the cream stone and in the shadow of this towering iron cross, lie the remains of 40,000 Spaniards, both Communists and Republicans, killed in la guerra civil that divided the country between 1936 and 1939. I arrived at the base of the monument and was instantly taken aback by its sheer scale and beauty. The cross is enormous, a stunning feat of human endeavour. It commands the valley with such force and seemed to create a powerful silence, emanating a presence that could only be met with wonder. Yet my feelings of awe and the numinous were also mixed with a distinct sense of unease, the kind you might experience when you hear Wagner’s Ride of the Valkyries or read The Boy in Striped Pyjamas. I had to remind myself that prisoners of war had died building this monument and that beneath my feet lay the bones of thousands. However it’s not the mass grave that is the true controversy of this site. Instead it is the fascist eagle that adorns the wings of the monument’s Catholic basilica and the single grave of the man lying behind its altar, a man who provokes reactions of anguish and confusion amongst Spaniards to this day: Francisco Franco. How can this be? How can history have been so accommodating to this man and yet not so to the others? Why, in effect, has Franco been granted a shrine? Having spent three weeks here in Spain I’ve come to realise that there are no easy answers to these questions. As I’ve walked the streets of Madrid I’ve come to sense that the scars of the Civil War and Franco’s era lurk close beneath the surface, neither fully healed nor fully understood. On the one side there are the passionate yet pained denunciations of Franco and his legacy. 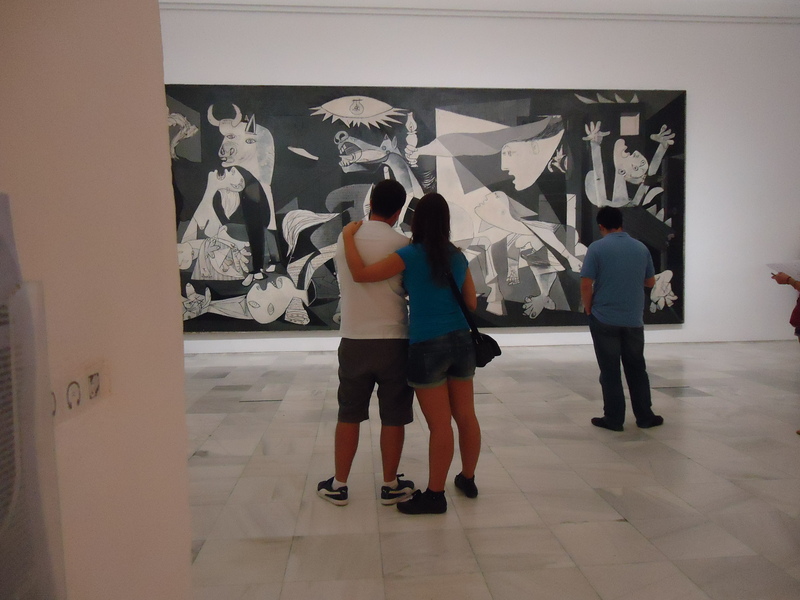 On display in the Museo del Reina Sofia is Pablo Picasso’s Guernica, the aesthetic epitome of this denunciation. It’s a stark, frenzied depiction of the horrors inflicted by Hitler’s Luftwaffe on the town of Guernica in the Civil War, one of the worst atrocities of the conflict. The painting also proved to be an ominous spectre for the repression and the concentration camps that would come to be a feature of Franco’s Spain. And then there were the oral denunciations from the Spaniards themselves who had lived through the oppression of franquismo. One example came from the lady I lived with who told me that she was the daughter of one of Franco’s generals. She described life under the dictatorship with an angry grimace. Women couldn’t go to university, she said, and there was essentially no freedom. There was a general curfew and widespread censorship. She described hers as a ‘lost generation’. Yet denunciations of this type always came in a hushed voice, a voice lacking the kind of conviction that we feel comfortable using when denouncing Nazi Germany or fascist Italy. I sensed that this hushed tone reflected an inner anxiety and ongoing confusion, a national inability to agree upon the true meaning of the past. 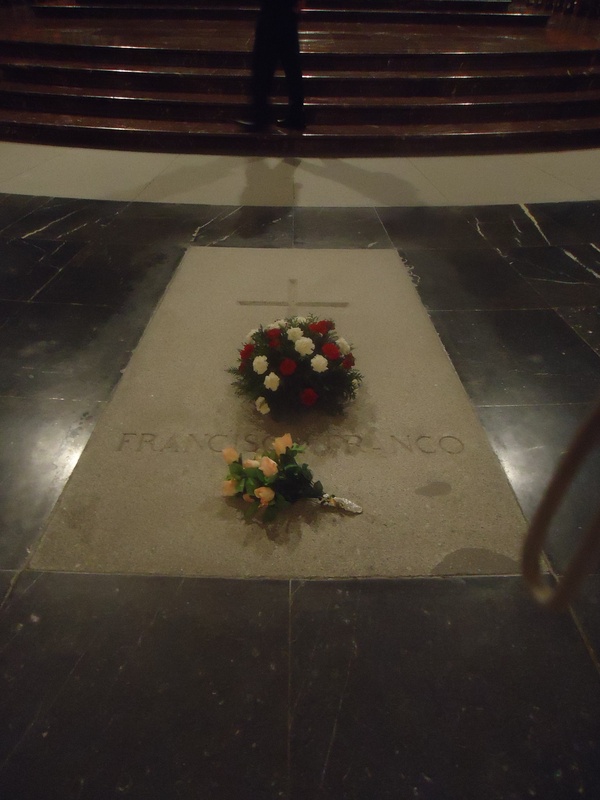 For whilst many denounce Franco, a significant minority defend him and his legacy (hence the fresh flowers on the tomb). To these people, largely comprising traditionalist Catholics and strong-minded conservatives, Franco was a hero, a man who brought safety and stability to an otherwise poor and vulnerable country. He saved Spain from communism, they say, and he strengthened the institutions of the church and the family. Even Franco’s critics begrudgingly admit that crime was almost non-existent under his dictatorship. Given this stark disagreement of interpretation I’m not surprised that the Spanish prefer not to speak of their Civil War and Franco’s rule. It’s all too recent, too contentious and too difficult to comprehend. Which brings us back to the monument and Franco’s grave. 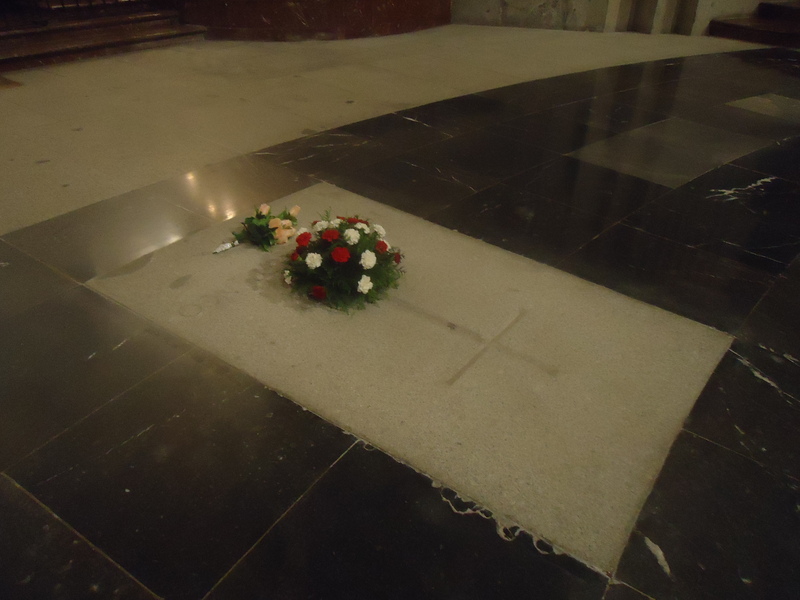 This is why his body is buried here and this is why the Spanish government is so hesitant to move it. The national scar needs more to time to heal. As I took the bus back to Madrid from the Valley of the Fallen I realised in a fleeting instant what had been so moving about the monument. It was the fact that it was so raw. There were no placards explaining the site, no information sheets telling you what you were seeing. Perhaps the Spanish aren’t yet sure themselves. It was just you, the silence and the bones of the dead. I think I prefer history this way. *It took me a while to get these photos. Cameras were strictly forbidden inside the basilica and there was a security guard patrolling the grave. Not to be outdone, I stood beside Franco’s resting place for a long time, figuring it was the closest I was ever going to get to a fascist dictator. After several minutes the security guard approached me and said I could take two photos but no more. And so I did.